I hope you all had a wonderful week - complete with St. Paddy's Day festivities. Remember how i said that it was almost Spring here in Saskatchewan? Well, because i tempted fate, we've had nothing but snow and freezing temperatures all week long. But at least it made for some good Snow Man making weather. Artoo and his friend making a snowman! Typically, Saskatchewan winters are too cold for snowmen. The air and snow are very dry and the snow doesn't stick together very well at crazy cold temperatures. Usually the last 2 or 3 snowfalls of the year hover around the 0C (32F) mark. So that makes for nice sticky snow. I was lucky enough to be the Kindergarten Helper mom on St. Patrick's Day - and what a fun day it was. Artoo's favourite colour is green, so he wanted to go all out. his classmates were all excited when a little Leprechaun named Liam made a mess of their classroom after recess while he was leaving Gold and Chocolates around the class. Artoo really had fun looking for treasure and helping his friends to clean up Liam's mess. Here's a little photo i took one morning this week. This was a classic case of being in the right place at the right time - because very shortly after i took the photo, it didn't look like this anymore. 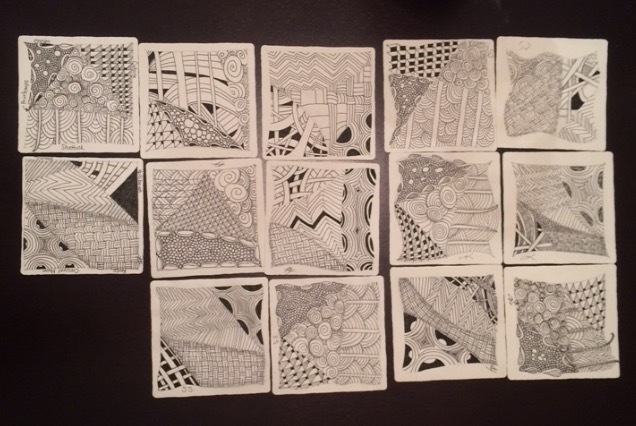 And Saturday night i was lucky to teach a lovely bunch of ladies and Intro to Zentangle class. I don't get a lot of chances to teach these days, so when i do - i really enjoy it. Weekly Challenge #260: "Monotangle: Shattuck"
A Monotangle is a term i coined here on the blog for a tile or piece created using only ONE tangle and it's variations. For my tile, i created a very simple string with only two spaces. Remember part of the fun of doing Monotangles is really stretching out the tangle and seeing what it's capable of and where you can take it. I really had fun with my tile - with my 'strict' shattuck vs my 'whimsical' shattuck. Such a cute Leprechaun! Beautiful sky too. Your Shattuck is really interesting. I love to see tangles "pushed"! A nice basis tangle this week, I like that!!!! I also like the photo of Artoo in green and the snowman ☃. Your tile is beautiful. Oh My Gosh! Just when I think your boys can't get any cuter....Artoo in his green suspenders! Swoon! Thud! Beautiful tile. You art just keeps getting prettier. And your boys are so cute...! Excellent pictures and a fun challenge! I was so happy to open this week's challenge and see that it was to do a monotangle using Shattuck, one of my favorites. I'm afraid I wasn't as imaginative as you, but I did get into a good zone while I was doing it. Awesome sunset (I shared one too), but I couldn't find any green suspenders. Cute! Love Shattuck - thanks for the challenge! Love that green shirt of Artoo's. I'm glad you've been having fun - you deserve it. I loved the picture of the sky in flames, that beautiful *-* I 'm a beginner, but I like challenges. So I'll try and hope to improve on the way. ¡Saludos! 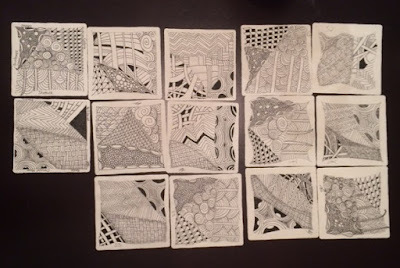 Shattuck was one of those tangles I learned from the start of my zentangle adventure. I did like it very much then and I am happy to realize that this pattern is still taking me away !And as a monotangle i could go on forever! Thank´s for a great challenge! Great challenge! Something easy for a person who has never entered a challenge, nor tried to draw the tangle. Glad to be able to participate for the first time. Thanks for the challenge! I enjoyed it. Love all the photos; Artoo looks so cute in his leprechaun outfit. For some reason, this challenge took me a while to get into. But once I started, it practically drew itself.